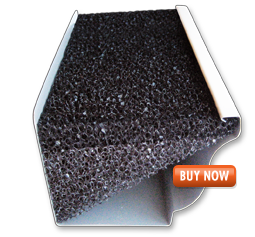 Welcome to American Gutter Filter, Inc. Providing the Best in Foam Filtering Technologies and Solutions! Safe-T-Flow® is "*fully coated" with an environmentally friendly enviroFR™ coating providing fire resistance technology, anti-microbial/fungicide additives, U.V. Stabilization and provides a "non-toxic mode of action" from plants. 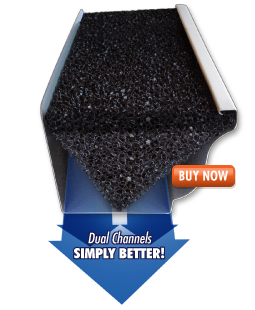 The GutterFill® PRO dual channels provide improved water flow, faster drainage and stronger center support! Support in the center, is better! The GutterFill® line, our patented triangle shaped filter, is available in two filter types, GutterFill® and GutterFill® Extreme. GutterFill® Extreme is "*fully coated" with EnviroFR™ a environmentally friendly coating, providing fire resistance technology, anti-microbial/fungicide additives, U.V. stabilization and a "nontoxic mode of action" from plants. No other triangle shaped filter can compare to GutterFill® Extreme! GutterFill® is "Top Coated" having fire resistance technology, with U.V. Stabilization. The use of "Infused plant-based biopesticides and insect repellents" are NOT found in GutterFill®. The video above is to illustrate how "Dual Channels are Simply Better". See and hear how fast the water enters the rear channel. Traditional triangle shaped filters that have excess material in the rear slow down the water from entering the gutter. 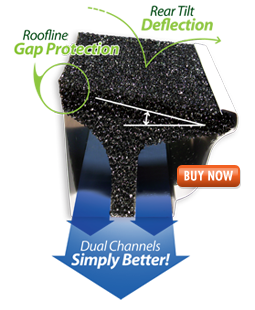 GutterFill® PRO - Support in the center, is better! *Individual results may vary. Check out our filters. | Buy our filters. GutterFill® was rated the highest foam insert by Consumer's in the Sept. 2010 issue over Leaf Defier® and GutterStuff®. American Gutter Filter had no knowledge of this "performance test" prior to testing! Testing was published by a non-for profit Union of Consumer's claiming they are the largest independent consumer-product testing organization in the world located in the United States. All products are made in the United States of America. Contact our corporate office today by phone at (847) 426-7885, online by email at info@americangutterfilter.com or via our contact form. American Gutter Filter, Inc. is not affiliated with GutterFilter Company, LLC or GutterFilter America, LLC. Safe-T-Flow® is protected under U.S. Patent No. 8,220,206. GutterFill® PRO is protected under U.S. Patent No. 8,220,206. All products Made in the U.S.A. Caution: Not to be used with potable water collection systems.